In our August 10 2015 post, we mentioned about the midcap mania in Indian market and discussed the possibility of a correction. We plotted the nifty chart and figured a head and shoulder pattern. We mentioned that if the neckline support of 7950 is taken there is a high probability of niftytouching 6850. Well, on last Friday, nifty touched 6869, just short of 19 points!!!. We still believe that markets have not bottomed out!! There is another well known guy in the market who predicted this correction. 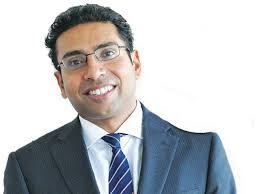 In September 2015 , Saurabh Mukherjea of Ambit Capital made a forecast for the Sensex falling to 22,000. In his several inverviews, he mentioned that the domestic slowdown and the powerful reset in government policies are coinciding with a major shift in the global economic factors. The challenges on the domestic and global fronts are "reasonably serious" and that markets will continue to struggle. Now since market is almost nearing his targets, we should give an eye on his recent views. In a recent interview on CNBC-TV18, he needs below three signals to confirm a market bottom. A recent bloomberg report shows that Capital outflows, slower government spending and central bank intervention in the foreign-exchange markets are draining funds from the banking system, pushing up short-term money rates. Seasonal factors such as a pickup in credit growth toward the end of the fiscal year in March could put even more pressure on interbank liquidity. Saurabh Mukherjea pointed out that in the last 3 months commercial paper (CP) rates have rocketed in India from roughly 7 percent to 9 percent which clearly means liquidity in the system is drying up. Last month IIFL pointed out that the Stressed assets of Public Sector Banks, which include NPAs as well as restructured loans, form almost 14% of the total advances of PSBs. This is a situation of alarming proportions. Also, this problem, which is being perceived as a big one currently, might become even bigger in near future as the stressed assets percentage can even grow to 20%. Banks are looking for atleast 50,000 crores from Government for covering up their NPAs. Either in the Budget or ideally before that, market is looking for an announcement from the government on what the new recapitalisation number is. If the CPI numbers of the three big western economic zones - US, Eurozone and Japan, go into the red, we have price deflation in the western hemisphere and the banking system in the west plus Japan clearly will be in a lot of trouble. All the great bear markets historically have come in deflationary circumstances. So, leaving aside whatever happens in India, we have to keep a close eye on CPI in the west. Saurabh advises investors to focus on capital preservation and added that there was no great profit to be made in the near term investing in stocks. Does it makes sense bulls? ?